As healthcare marketers plan for 2016, what should they be concentrating their digital budgets on? Overall, the importance of non-traditional channels is projected to increase across the board over the next 12 months, so there are a wealth of options to choose from. Some 80% of U.S. consumers say they already use digital platforms to interact with healthcare organizations, and that number is expected to grow in 2016. So, which of the many tactics and platforms deserve additional investment? The major challenge for healthcare marketers in the year ahead is this: digital experiences—websites, email, social media, apps, etc.—are now serving double-duty as both brand-building outlets and utilitarian tools. This means it’s essential to increasingly invest in channels and tactics that are core to the user experience, not simply promotional. 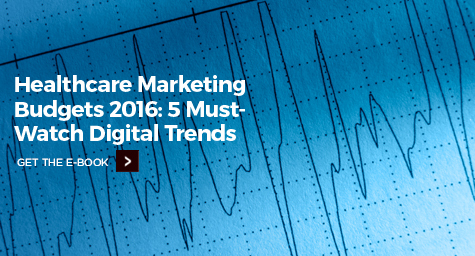 The new e-book from MDG Advertising, “Healthcare Marketing Budgets 2016: 5 Must-Watch Digital Trends,” explores the key online areas that are expected to grow rapidly and which also serve a broader purpose. The complimentary e-book examines why each of the channels and tactics matters, and what you’ll need to do to make the most of these opportunities. Content: Americans are increasingly engaging in “DIY healthcare” using information they find online; learn what this means for 2016 content planning. Experiences: Consumers want digital tools from healthcare brands that make their lives easier; find out why it’s essential to build these tools despite the significant investment. Mobile: The rise of mobile has been rapid but also nuanced; understand why it’s important to take a step back and conduct a device audit in the year ahead. Social: Forward-thinking healthcare organizations are opening up their social media accounts to more in-house experts; explore why this trend is one to follow. Data: The rapid growth of Big Data holds great possibilities but also poses major challenges for brands; understand what steps need to be taken to make the most of it. Check out the full e-book for in-depth analysis on why each of these areas is expected to be important in 2016, and for specific recommendations on how to capitalize on their growth. Discover the latest tactics in healthcare marketing. Contact MDG Advertising today at 561-338-7797.